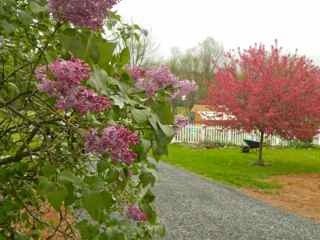 Blooming lilac and crabapple in my garden today. 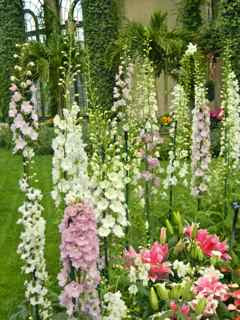 As a gardener, three sources of inspiration for me are garden books, garden blogs, and visiting beautiful gardens. Years before I gardened, when I needed an escape from the stress of my job, I read about gardening and began collecting garden books. My personal library continues to expand, but last week, for Earth Day, I read a book from the church library (where I am volunteer librarian) to our preschoolers there. 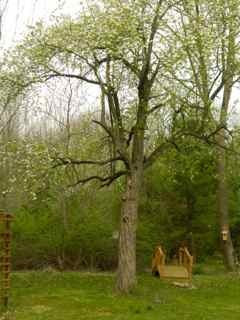 I have chosen this children's book, The Oak Inside the Acorn by Max Lucado, as my entry for the Earth Day Reading Project sponsored by Michelle at The Sage Butterfly. I feel this is a fitting choice for a post on Inspiration, as Lucado is considered one of America's leading inspirational authors. The lovely illustrations are by George Angelini. This beautifully written story is about a little acorn who finds it hard to believe he will ever be a big oak tree. 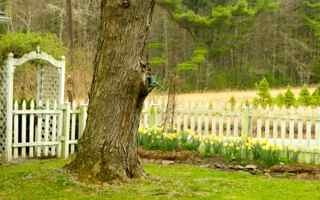 He is afraid to leave the safety of his mother's branches, but he is planted in a farmer's back yard where he grows year-by-year along with the farmer's little girl. 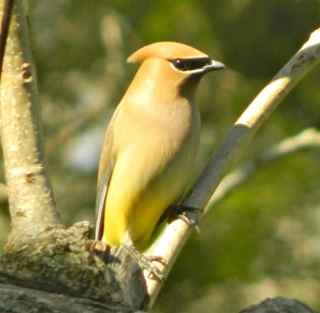 He doesn't know what he is supposed to do, but he heeds his mother's advice, "Just be the tree God made you to be," and one day he finds a very special purpose for his branches. The story speaks to young and old. It is especially important for parents who are raising their children to be unique, and then letting them go out into the world. It encouraged me to answer the question, "What is my place in the world?" Donna of Garden Walk Garden Talk asked a similar question in her recent Earth Day posting. My place on Planet Earth has changed over the years. Today, I am many things, not least of which is a gardener. 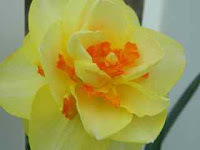 I am also a garden blogger, finding inspiration from other bloggers. It was my good fortune to meet two of them recently: Carolyn of Carolyn's Shade Garden and Julie who blogs at Wife, Mother, Gardener. 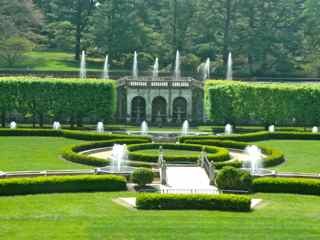 It was Julie's idea for Pennsylvania garden bloggers to get-together. It was a wonderful weekend. 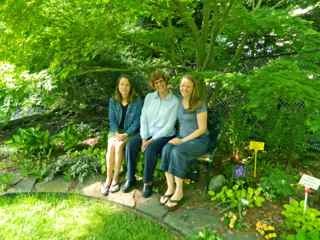 From left to right: Carolyn, me, and Julie in Carolyn's garden. 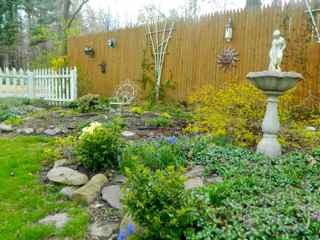 Carolyn's beautiful garden is a true inspiration. 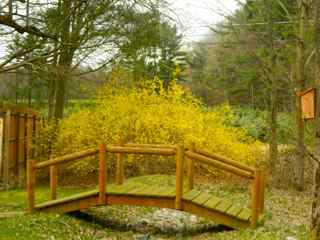 One of my favorite spots there is the woodland garden where all sorts of hostas, ferns and native plants can be found. 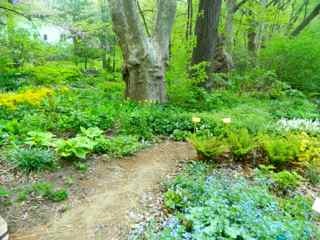 It is how I wish my Woodland Walk looked, but until we eradicate the invasive plants and build a deer fence, I'm afraid it will never happen. My visit inspired me to start a miniature hosta collection. 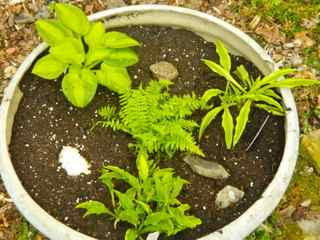 I purchased three with a little fern, and upon my return home, I planted them in a shallow dish. 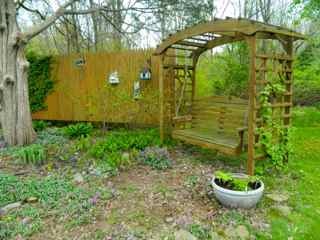 I placed the planter next to the swing in my shade garden, where I can admire them when I sit there. 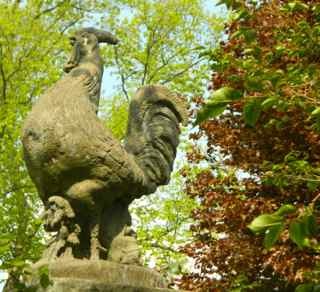 Chanticleer is the name given to a rooster, especially in fairy tales. 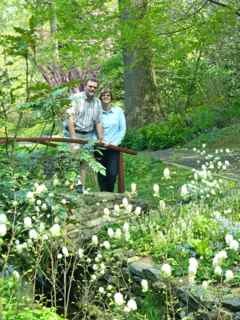 One of the romantic winding paths at Chanicleer. 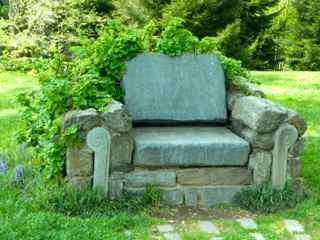 I think of this unusual stone chair as 'Carolyn's Chair' because I first read about it on her blog. It inspires me to think more deeply about the seating in my garden. 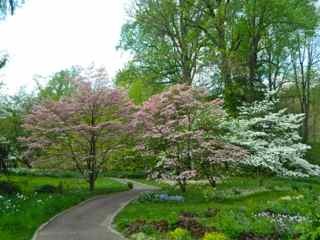 I loved the plant groupings at Chanticleer. Obviously a great deal of thought is given to the pairings. 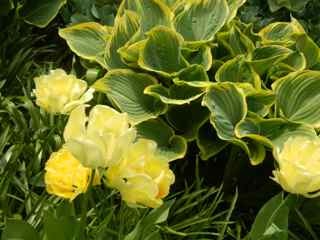 Yellow tulip with yellow-edged hosta. 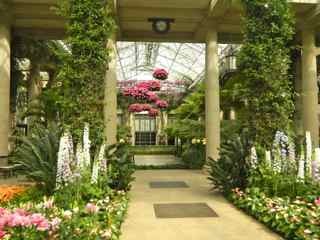 The day before we visited Carolyn and Chanticleer, we went to another inspirational garden, Longwood Gardens at Kennet Square, PA. 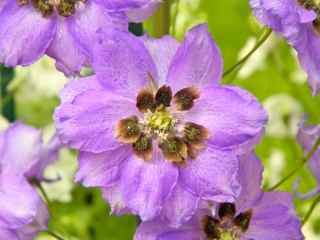 Inside the conservatory, HH and I were excited to find a delphinium called Astolat. Our farm, which is HH's childhood home is called Astolat. This is a meaningful name in his family's history. Of course, I have lots more photos of my visits to these inspirational gardens. Expect more in future postings. And thank you Julie and Carolyn! 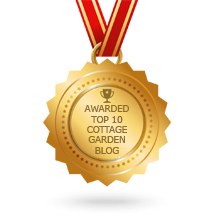 You prove what I have always thought, Garden Bloggers are the Best!! 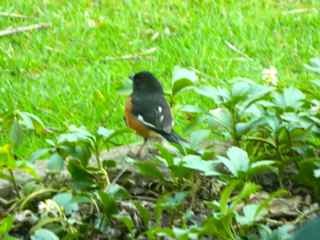 Finally, I get inspiration when taking my morning walk around my own garden. 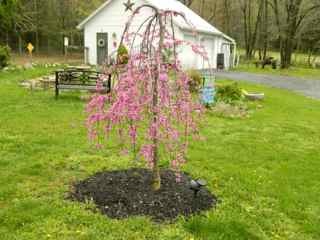 Today, not only are the crabapple tree and lilacs blooming, but also my weeping redbud. Unfortunately, my camera didn't pick up the true lavender color of the blossoms. 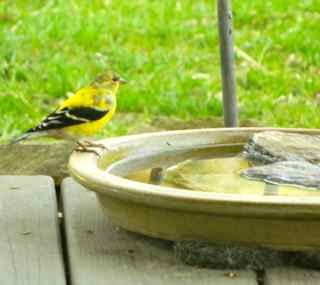 In this posting I am not only linking with Sage Butterfly's Earth Day Reading Project meme, but also Donna's Word4Wednesday at Garden Walk Garden Talk. 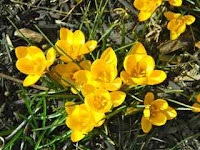 I haven't forgotten Holley at Roses and Other Gardening Joys whose meme 'Monthly Garden Book Review' I missed this month, but I do encourage you to go over there and get some great reading inspiration. Also, do visit Carolyn's Shade Garden, both the blog and the place if possible; and you will love Julie's Wife, Mother, Gardener blog which is sure to inspire you. 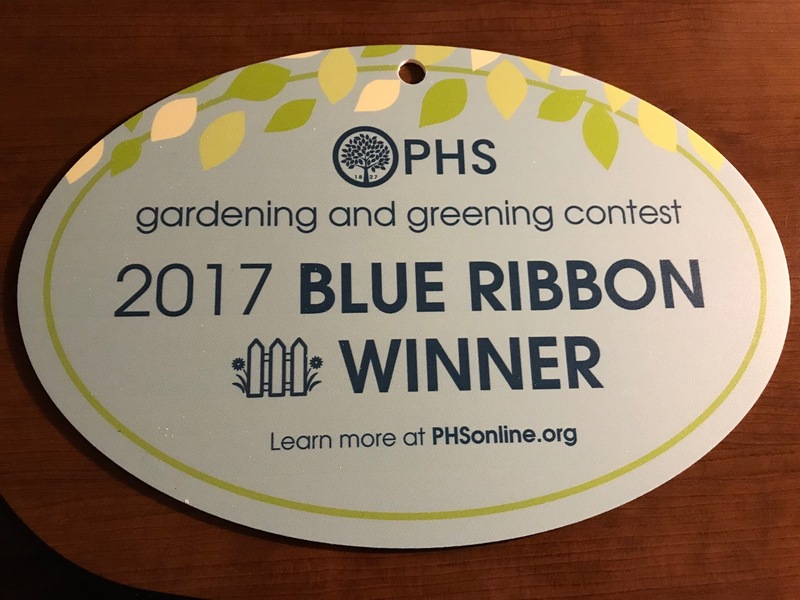 Happy reading, happy blogging, and happy gardening! 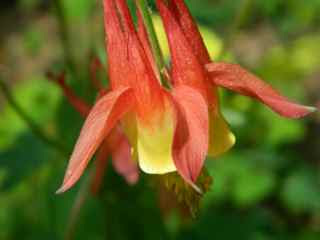 Yesterday was Garden Bloggers' Bloom Day and Carol at May Dreams Gardens asked, "What’s blooming in your garden today? 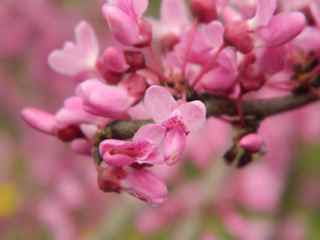 Are the blooms early?" 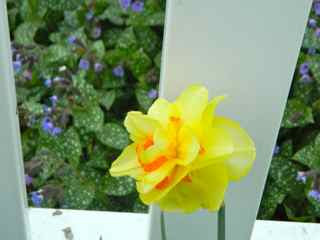 My answer -- flowers that normally bloom in May are in full swing in my garden already! 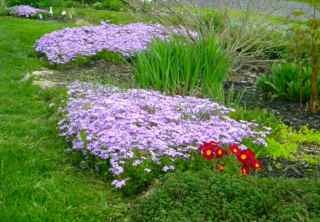 This includes the lovely Creeping Phlox (P. stolonifera) that forms large patches of purple color at the edge of my borders, in stone paths, and around the pond. 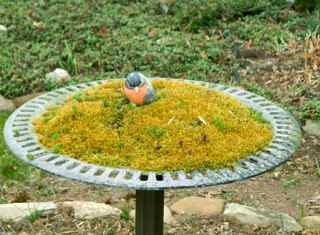 Each mat of semi-evergreen foliage grows 4-6 inches high. 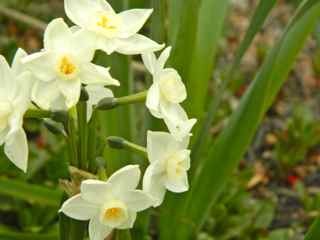 It blooms steadily and thrives even in poor soils. 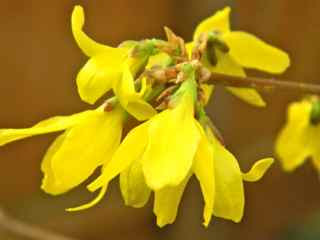 This pretty, native ground-cover dominates my garden in early to mid spring; a signature plant indeed. 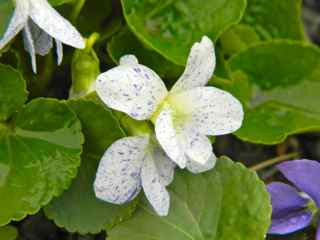 Other early blooms are brunnera, barren strawberry, lamium, ajuga and viola. 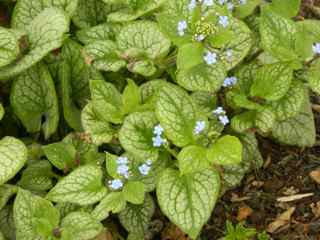 Brunnera Brunnera macrophylla with its forget-me-not-like flowers. 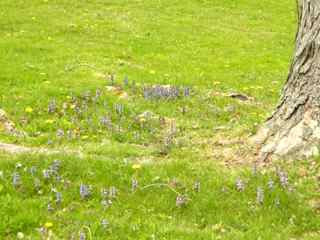 Bugleweed Ajuga and (very early) dandilions under the maple tree. 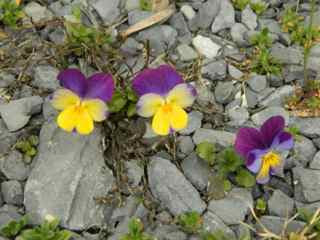 My favorite violet Viola sp. 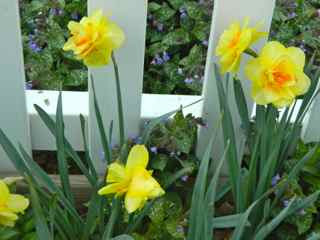 Most of the daffodils are faded, but there are still a few 'late' ones blooming early. 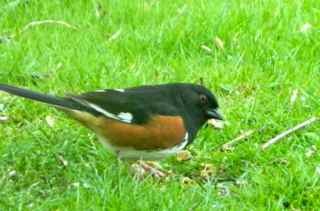 To further celebrate this April Bloom Day, we were honored with a special visitor -- the first Eastern Towhee we have seen in my garden. 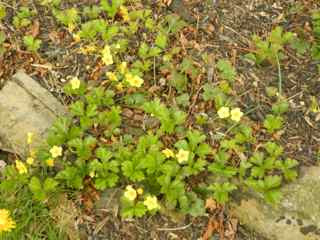 Thank you Carol for hosting the lovely meme, Garden Bloggers' Bloom Day. 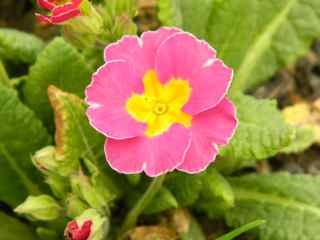 I am also linking (early) to Diana at Elephant's Eye with my Signature Plant 4 (Creeping Phlox) for her Dozen For Diana meme. Do click on the links (colored red) to join the fun. The weather is very hot for the time of the year, my garden is blooming early, and I am so happy to be working outside all day again! 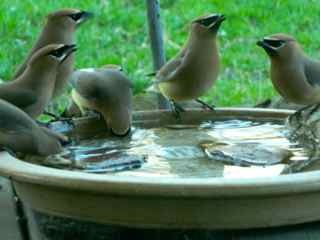 I hope you are enjoying your garden, too. 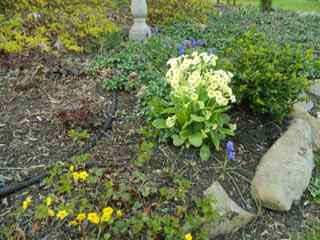 Primrose, barren strawberry, grape hyacinth, heuchera, and lamium. I don't have my soil tested every year, but following last year's above-average rainfall, I wondered how many nutrients were washed away, and decided it was worth the effort this spring. As well as nutrient deficiencies, a soil test can tell you the soil's acidity (pH) which is important because if the pH level isn't in the correct range, plants cannot take up nutrients. 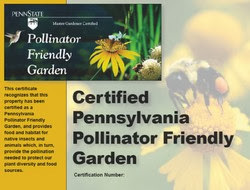 I purchased three soil testing kits from our local Extension office to test the soil in the shade garden, the cottage garden and the vegetable garden. 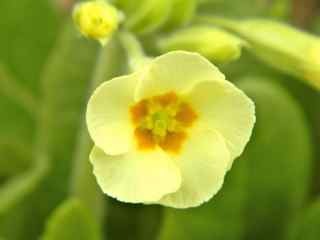 These areas are devoted to different types of plants (flowers and vegetables), or are composed differently (lasagna garden and tilled garden), so require separate samplings. Each kit comes with easy-to-follow instructions and diagrams showing the spacing of the samples. 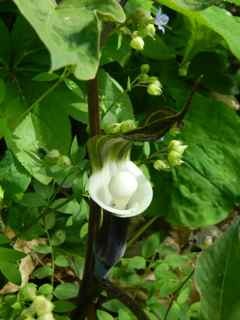 I began in the shade garden. 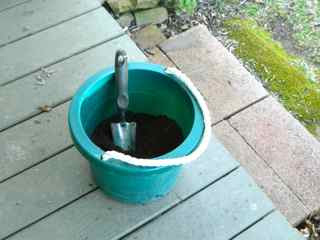 Using a trowel and a clean pail I obtained thin slices of soil from at least 13 places in the shade garden. 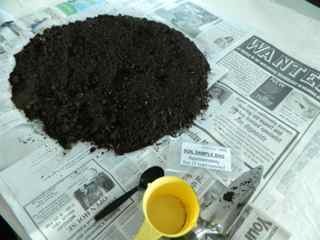 I collected soil to a depth of 6 inches, the approximate depth of each plant's feeder roots, first removing debris from the surface. I mixed the samples together in the bucket. 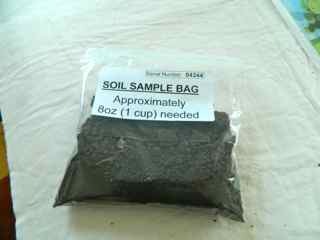 The next day, I took a 1 cup representative sample and placed the soil in the mailing kit bag. 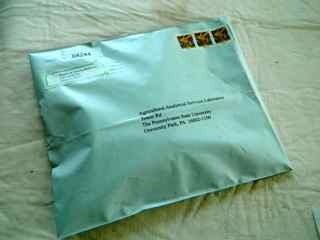 I filled in the form that was provided and placed it in the mailing envelope and sent the packet to the laboratory at PennState University. 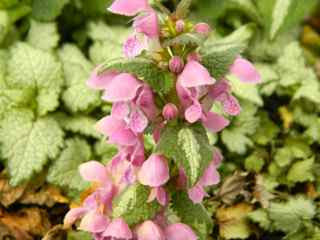 I took samples from the cottage garden and vegetable garden in the same way. 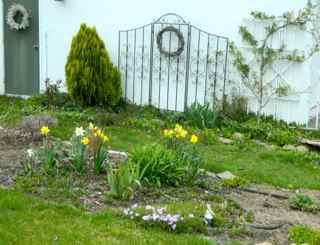 The cottage garden is waking up. 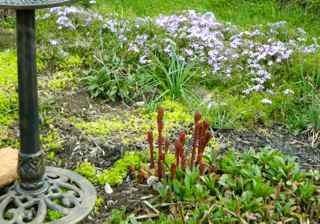 Creeping phlox and red peony shoots next to the first shasta daisy leaves. 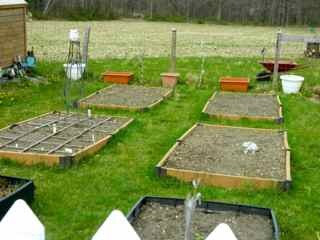 The kitchen garden -- one bed planted with cool-weather crops. The pH scale measures how acidic or basic a substance is. The pH scale ranges from 0 to 14. A pH of 7 is neutral, a pH less than 7 is acidic and a pH greater than 7 is basic. 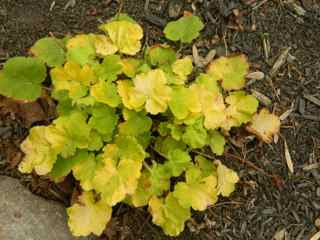 My shade garden has a pH of 7.2. 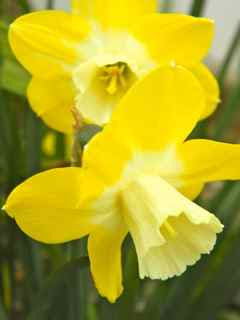 Most of the shade plants prefer a more acidic soil, so I need to add sulfur. The report includes recommendations for the amount of sulfur needed per 100 sq ft.
Every year I apply liberal amounts of organic matter to all my gardens, and an interesting result of the testing shows all my beds have a CEC (Cation Exchange Capacity) of 17+. 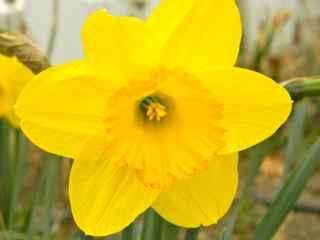 This means, in simple terms, that I don't need to add compost this spring. 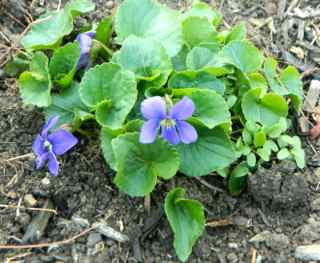 The report recommends adding 1 inch of organic matter if your soil is less than 15.0 CEC. 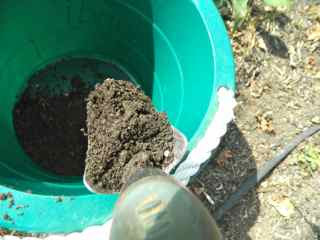 There were slight differences in the results of the vegetable garden soil and the cottage garden soil. 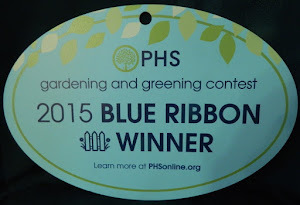 I am so glad I got the tests, as I now have a plan to grow better gardens. I highly recommend you make the effort -- it is definitely worth it! 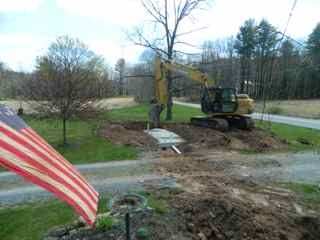 On another note, we have a mess to clear up due to the instillation of a new septic tank (one of the joys of living in a rural area where we need our own sewage system). We need to replace a lawn, repair a flower bed and reinstall the stone garden which houses my container garden! 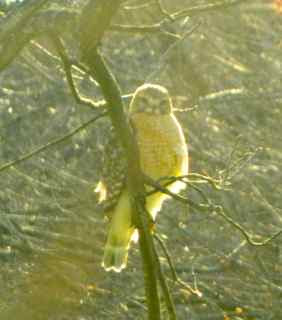 The red tailed hawk looks golden in the bright sunlight. 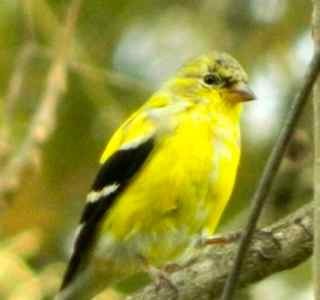 March was a mellow yellow month. I wonder what color April will be?